Jack - Hales - also known as 'John'. John (Jack) Hales was born on the 31st December 1895 in Wistow, Huntingdonshire being the second oldest child of James Samuel and Mary Elizabeth Hales. James Samuel and Mary Elizabeth were married on 11th November 1893 at St. Margaret's Parish Church, Upton, Huntingdonshire. Both were residents in Copingford, the neighbouring parish, Huntingdonshire. Family information indicates that there were 12 children in this family and they were all born in Wistow, Huntingdonshire. He was the brother of Burrus James Hales, also of Wistow and fellow Cyclist. Data kindly provided by his family - Janice Smith and Stephen Howes and Elizabeth Cunningham - thanks to all of them for their support of my project. John Hales had an brother, Fred Hales. 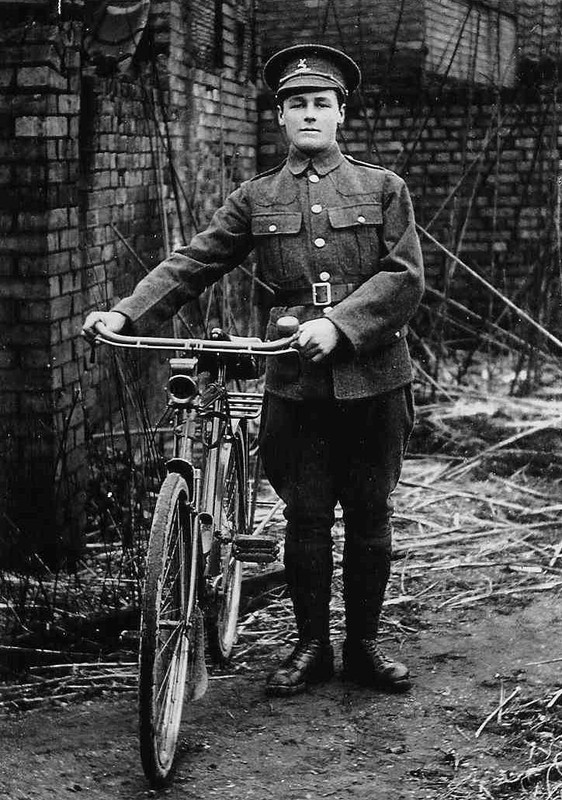 Fred, the eldest child of the family, also served in WW1, but we can't prove if he was a Cyclist or not. We do know that Fred survived the war, returned to Wistow after the war until 1957 and may have been awarded the Croix-de-Guerre at Vimy Ridge in 1917 or 1918. Information kindly provided by his family indicates that he could have served for nearly 4 years in WW1, and also mentioned landing in Gallipoli, as well as serving in Turkey and France. After the cessation of hostilities he left England fairly soon afterwards for Canada, later travelling to Sydney, Australia, and then he finally settled in New Zealand. Thanks to Elizabeth Cunningham (nee Hales) and Janice Smith for background family data.